BELLVILLE — If you have a chance to meet a light tan-colored dog named Clyde, you’re going to have had the fortune of meeting a majestic, regal and brave veteran of military service in Iraq. Clyde is getting up in years, but if he had the chance to talk he’d probably tell you he thinks he’s the luckiest dog alive. Army veteran Clyde walked in the Memorial Day parade in Bellville last week, along with former Army Lt. Col. Ronny Echelberger. He wore a vest made especially for him. It is complete with military medals. Clyde is probably 13 to 14 years old, Echelberger said. He was shipped to the United States in 2005 in a circular, confusing series of events, orchestrated by Echelberger and others who helped him in Iraq. Echelberger said he was getting ready to leave Iraq, and decided he couldn’t leave Clyde. He found someone in Kuwait City who said “if you get me the dog, we’ll ship” him. He made contact with an international veterinary hospital, which vaccinated, neutered and then quarantined Clyde. He was also given a chip, which owners sometimes place in animals so they can keep track of their whereabouts. After he went through the quarantine period — about four weeks — he was flown to Detroit, Michigan on Royal Dutch Airlines. Before being able to leave Iraq, Clyde had to get to the veterinary hospital. Contractors who ran supplies said they’d transport Clyde to the hospital. But when they got to the border, officials there said they wouldn’t let him pass through because he didn’t have anything official saying he could go. Echelberger told the contractors to get some official kind of letterhead, saying Clyde was an official Army working dog. They did that, and guards let him through. When he arrived in Detroit, Echelberger’s sister picked him up and brought him here. He lived with Echelberger’s parents while Echelberger continued to serve. Echelberger did three tours in Afghanistan, two in Iraq and one in Panama. He was in that country in 1989 when the late Manuel Noriega was there. Dogs are a commodity not appreciated in a place like Iraq, Echelberger said. It is a feral dog population there, and many are killed. Clyde was a guard at the compound where Echelberger was stationed. The activity around the compound didn’t frighten Clyde. He was used to shelling, and knew Army officers were his friends. Echelberger said he thinks Clyde could distinguish who people were. “Dogs know human nature,” he said, and Clyde didn’t like Iraqis. Echelberger said Clyde was “invaluable” in his work in Iraq, and he didn’t mind paying the $2,500 it cost to get him shipped to the United States. Clyde was Echelberger’s companion in Iraq, and no others there expressed an interest in caring for him. One person did call Echelberger and say he’d like to see Clyde. This person traveled to Mansfield for a visit. Clyde’s life in Iraq was similar to those of Army personnel. There is no American style dog food there, so Clyde ate lots of bacon and powdered eggs — Army fare. At one time, Clyde developed something that could have been mange. Echelberger contacted someone in the Army, who said he couldn’t officially treat Clyde, but if he was brought to see him at a certain time, he could help. He got shots, antibiotics and was wormed. Since Clyde has been here, he has had a “decent” American style diet, Echelberger said. He is also treated by a local veterinarian, here in Bellville. Because he is up in years, he has developed the beginning stages of renal failure. He also has difficulty seeing at night and in some instances is unstable. Clyde is on a special “kidney diet,” eating dog food that costs $3 a can, Echelberger said. He visits his veterinarian every two weeks and gets a saline solution, which helps maintain his water level. When Echelberger served in the Army, he did a variety of jobs, including being in the infantry and being a test parachutist. His parents Charles and Carol Echelberger cared for Clyde in Mansfield while he was deployed. Photos of Clyde while he was in Iraq show a dog with a darker coat. Seeing the aging process in his dog is not something Echelberger likes to consider. He said he will care for Clyde and as long as he maintains a “good quality” of life. When it comes to a point where he shows “any indication of pain” or he can’t stand or walk, he will have to put him down. He said he intends to have Clyde cremated and have his ashes strewn over the grave of his mother. 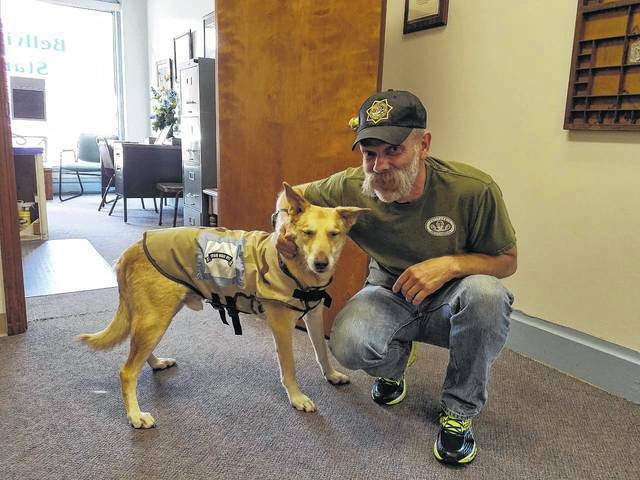 Louise Swartzwalder | Civitas Media Clyde, in his special vest, with former Army Lt. Col. Ronny Echelberger. http://aimmedianetwork.com/wp-content/uploads/sites/38/2017/06/web1_clyde.jpgLouise Swartzwalder | Civitas Media Clyde, in his special vest, with former Army Lt. Col. Ronny Echelberger.